In 2004 "A New Era" began!! 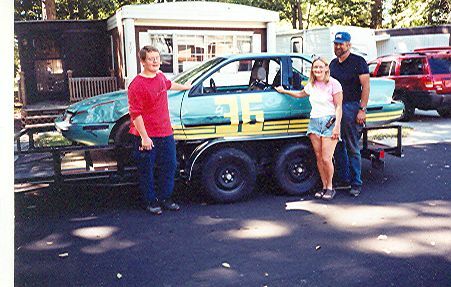 Kathy(my wife) and Dennis Shutt Jr.(my younger stepson) began racing in the "Mini Thunder Car" class at Mottville(MI) Speedway. A "mini thunder car" is a front wheel drive car, and must be 4-cylinder, or a V-6 automatic. No DOHC or turbocharged engines are allowed. Tires must be DOT radials no wider than 65 series. No modifications other than safety equipment are allowed. They are intended to put the fun back into racing, and allow you to race competitively without spending mega-bucks, which they do. Without a class like this it wouldn't have been possible for us to put 2 cars on the track. Dennis, Kathy, and I ready to go to the track with Kathy's '92 Beretta. 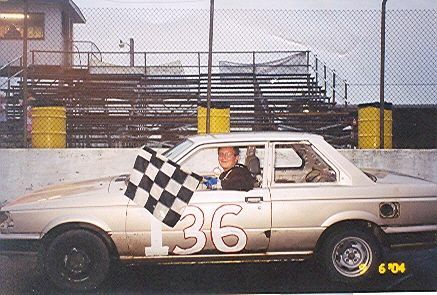 Kathy had raced a Nissan Sentra for a few weeks, but it was a little underpowered, so she used the money she had been saving for new living-room carpet to buy this Beretta with a winning history from Chuck Hall. It seems Kathy had a "change in priorities"!! What have I done...created another racing addict....and we needed that carpet!! This was Kathy's first ever win!! She won the dash, and was so excited about winning that she didn't even think to take her helmet off for the victory pic!! Kathy's first heat win, the same day as her first win in the dash. This time she took her helmet off for the victory pic!! 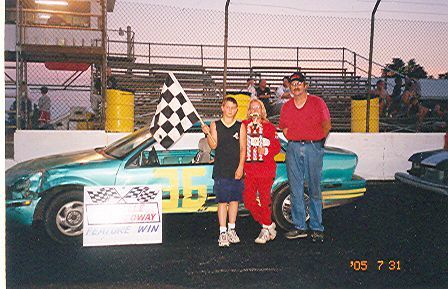 This was Kathy's first feature win on Sep. 19, 2004. 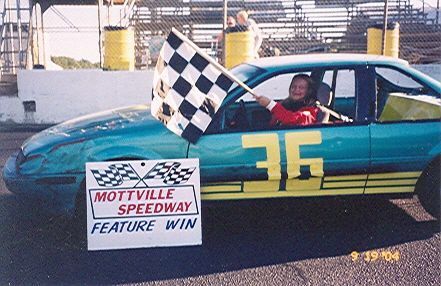 Kathy ended up the year with 12 checkered flags. 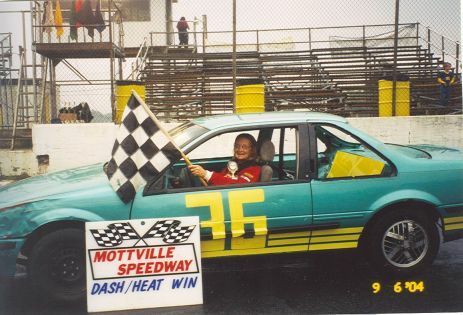 Her win total included 5 heat wins, 3 dash wins, 1 Austrailian Pursuit win, and 3 feature wins. She even managed a "Clean Sweep", winning the heat, dash, and feature all in the same day. It took me 20 years to get one! 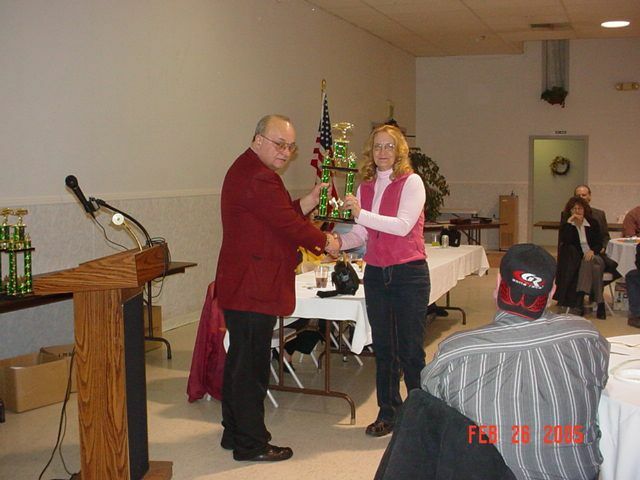 Kathy ended the season 4th in mini-thunder car points, and won the Rookie Of The Year title!! I'm really proud of her!! Dennis' best run in the Nissan Sentra was 2nd place. He managed it on "trophy day", where the first 5 finishers in the feature were awarded trophies. Here's one happy 15 year old, with his first racing trophy! Dennis ended the season 9th in points, pretty good for a 15 year old that didn't even have his learners permit yet! 4th Place points plaque from Merle Holden. Update: April 9, 2005. Mottville Speedway's opening race of the season. Kathy took 2nd place in the first heat, 1st place in the 2nd heat. At the start of the feature, a new driver spun directly in front of Kathy, and she was unable to miss him. Not too much damage, but it blew the fuse for the ECM, so she was unable to finish the race. I'm confident that she would have had 1st or 2nd if not for the accident. April 16, 2005. After a number of repairs this week we were ready to go! We found a vacuum leak, and a leaking brake line so I fixed those. Also installed new plugs and wires. Kathy took 2nd in her heat. Then checked out and left in the feature, winning by about 3/8 lap!! It sure was a happier ride home this week!! 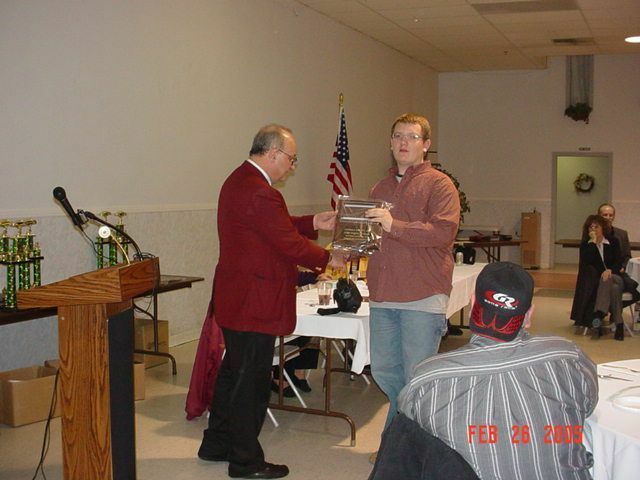 July 31, 2005, my grandson, Brandon's 14th Birthday. We took him to Rapid Raceway in Angola, IN where he rode the go-karts 7 or 8 turns, he had a blast!! 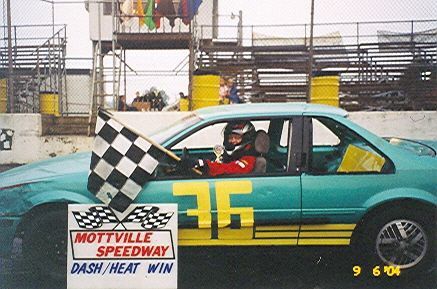 Then, on to Mottville Speedway where Grandma Kathy got a 4-race clean sweep, winning the Dash, the Australian Pursuit, the Heat, and the Mid-Season Championship Feature!! It was the first time Brandon had watched Kathy race, and she managed to win every race! This was a very special day for all of us!! Kathy ended the year with 37 Checkered Flags!! Kathy won 15 A-features out of 23 tries!! Plus 22 preliminary race wins (dashes, heats, Australian Pursuits)!